A bill introduced in the House of Representatives early this month would provide air medical providers with an immediate boost in the Medicare reimbursement rate and a recurrent mechanism to measure costs and justify future rate increases. The co-chairmen of the Congressional Air Medical Caucus on February 10 introduced legislation, H.R. 822, that would amend title XVIII of the Social Security Act to require reporting of certain data by providers and suppliers of air ambulance services for purposes of reforming reimbursements for such services under the Medicare program. While this data is being accumulated, air medical providers would see a 20-percent increase in the Medicare air medical transport base rate the first year after enactment, with subsequent 5-percent increases for the next three years. Patients covered by Medicare and Medicaid account for approximately 56 percent of all medical transport flights, and air medical providers have long maintained that reimbursements from these programs do not cover actual costs, forcing them to charge more for those who self-pay or those with private insurance, who represent 11 percent and one-third of all patients, respectively. For those with private insurance, insurers cover the costs approximately 80 percent of the time. The legislation introduced by caucus co-chairmen Reps. Pete Sessions (R-Texas) and Gregory Meeks (D-N.Y.), along with Todd Young (R-Ind.) and Bill Johnson (R-Ohio), would require the Department of Health and Human Services to create and implement a system for air medical Medicare providers to report their cost on specific cost drivers that represent the basic operational costs at an average air medical base. The Government Accountability Office (GAO) would be tasked with analyzing this cost data and issuing a report to Congress to provide realistic guidance for future reimbursement rate adjustments. Additionally, the bill calls for the Secretary of HHS and the GAO to issue a report, updated annually, on certain industry clinical quality measures taken from the Air Medical Physicians Association 2013 “Must Have” Consensus Metrics. The bill identifies air medical cost drivers as maintenance, medical supplies, fuel, employee expenses, recurring training (aviation, maintenance, communication and clinical), rent and utilities, communications, travel, insurance, marketing, supplies, overhead, support, aircraft ownership expense, safety-enhancement capital costs and safety-enhancement recurring costs. It's fun to blog about HEMS. It's deeply satisfying to be in a room with flight teams discussing AMRM. I enjoy traveling and serving EMS pilots as a volunteer-member of NEMSPA's board. But nothing compares to actually doing the job of a HEMS pilot. It doesn't pay much, but it's emotionally rewarding. It keeps me honest and filled with humility and respect for those with whom I serve. Over the years there have been some remarkable flights. Flights in which great work led to good outcomes, and camaraderie, and laughs. The medic on board, "Terry" (not his real name) says, "Okay! I am starting CPR, get ready to shock her." What follows is a non-stop determined effort to keep this woman alive. Her heart is giving up - failing, but Terry won't have it. He talks to her, and us. "Come on lady, don't give up on us. You are going to make it!" The CPR alternates with repeated drug therapies and multiple shock events. "Charging! Clear!" I take my hands off the controls. She jerks on the cot next to me. Compressions resume. I radio the com-center, "the guys are busy and can't talk now, the patient's in arrest, we are going to need help at the pad." "Roger. Help at the pad"
I want to be helpful too, but I have to remember that my job is to fly the helicopter. "Calm down, do the job, ignore this drama." We HEMS pilots can't let the impending death of a patient distract us, or cause us to do something different - or stupid. We have to fly the helicopter with the action inches away. Not long ago, I heard an industry-leader state that we pilots should keep medical personnel "out of the cockpit." The problem with that idea is that our cabins are so small that not only are crew-members in the cockpit, so is the patient, and the cockpit is where the CPR happens! Terry is bent over at the waist, pushing on her chest. "Come on lady! Come on!" her heart runs through bouts of V-Fib, asystole, and occasionally short periods of normal sinus rhythm, and still he works. Terry is burning up, sweating, breathing hard, CPR is hard work. The fart is potent and floods through the cabin. I pull the vent knob and open my window. Whoa! It breaks the tension and we all burst out laughing. Steve says, "Hey! she's got a rhythm!" She maintained that rhythm through the landing and being rolled to the cath lab. What i was seeing was a pilot that is used to flying in worse than crap weather. But in a suitable aircraft. And i was seeing a new flight nurse that didn't know how to say no, or didn't want to. They agreed and we waited. I received no flack and no push back. I felt like i almost watched their faces go, “wow, we almost made a dodgy decision. That would have been really dumb. Yeah, lets wait for stuff to clear.” We waited till we could see stars, and the weather continued to break. We lifted with clear skies and stars in our windscreen and made an uneventful flight home. You can contribute too. Really. 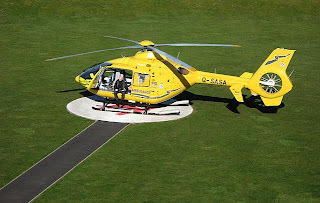 If you fly HEMS this is your blog. I know you can save a patient; I want you to save a crew. I was laying in bed the other morning, thinking about speaking to an international audience who were going to be listening to me not because they had to but because they chose to; a first-time event. I teach subject matter that is required by CAMTS, and the Code of Federal Regulations: the body that certifies air medical transport companies and the FAA. Thus far the folks in my classes have been there because the boss said so. I was trying to sort out how to approach the problem of being meaningful, and how to relate to the audience. Sitting in front of me would be all sorts of people filling all sorts of roles in health-care, from senior leaders to the newest entry-level healthcare provider, from pilots to paramedics to professional safety managers. Finally I decided to just talk to the people who work where the metal meets the mud; the flight crews. When I lecture - I am talking to them, because I want them to stay alive. Tragically, as I was thinking these thoughts three persons were losing their lives in a helicopter. In our industry, safety folks are all about implementing "safety-management-systems." One organization after another touts the fact that they have "exited level one, or two, or three" and so on, and to be sure I hope that eventually these things will help prevent accidents. But what about not dying right now? I attended a class in which a very smart, educated, and thoughtful pilot and safety executive put up slide after slide explaining that there really are lots of players in our game, and any one of multiple contributing factors can be why we crash aircraft and kill people. Good Stuff. How do I stay alive. What about you, dear pilot, or nurse, or medic, or RT? What will you do to stay alive throughout your flying career? Do you have any personal strategies, or tricks, or philosophies on how to not get dead? If not, perhaps you should give this some thought. Because what we do is dangerous. According to the American Journal of Clinical Medicine (Winter 2009 issue) after assessing past statistics then projecting them forward, they predicted that if you fly in a HEMS helicopter and do that job for twenty years, you face a 40 percent chance of losing your life. Before I started writing this, sitting in my sun-room on a Sunday morning, I was reading the weekend-edition of the Wall Street Journal. This is a great paper, with tons of information that is a bit over my head, and - my favorite part - book reviews and excerpts. One article covers Dr. Thomas Lee, a professor of medicine at Harvard, and his new book "Eugene Braunwald and the Rise of Modern Medicine." In this article there is a line about Dr. Braunwald; "over six decades, he (Braunwald) was repeatedly in the right place, at the right time, with the right people." 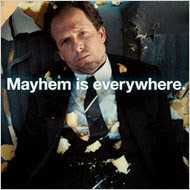 This is my advice to you, dear HEMS person who climbs into an aircraft and takes to the sky. Seek always to put yourself in the right place at the right time with the right people. It's as simple as that. 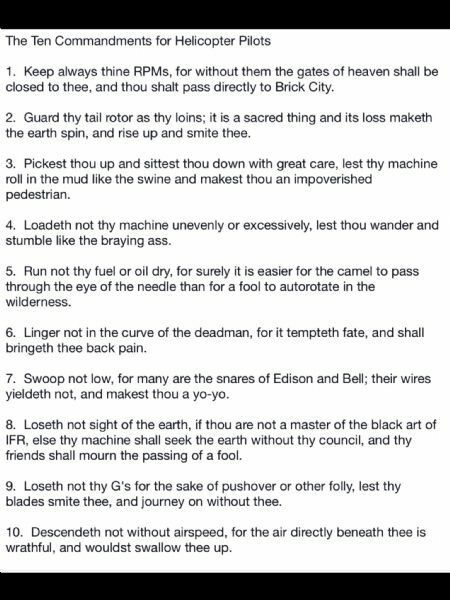 If you are not sure where the right place is, educate yourself. Your heart and your head will tell you about the people. The time is now. In the right place... I now fly a single engine aircraft. I have dedicated myself over the last year to continuously evaluate if I am in a position to survive the loss of that one engine. When I take off, I fly as close as possible to the way the operators manual says I should, at max-continuous power, at best-climb speed, to an altitude allowing a safe landing should my engine fail. I deliberately fly as if the motor is going to quit, even though the odds are that my engine won't. If I am not in the right place, I try and get there as quickly as possible. My new flying style elicits comments from the back like, "wow, I never saw this view from such a high altitude," and "gee, things sure look different from way up here." This at two thousand feet above the ground! Why do we persist in flying so low? By way of explanation...The odds of a sprag-clutch failing to engage on engine-start are probably a billion to one. That happened to me in a BK, and resulted in around a million dollars worth of damage to the aircraft I was in command of. I am not immune to bad fortune. If an engine is going to quit, I take it for granted that it's going to quit on me. I don't want to be in the wrong place when it happens. With the right people... I heard a story not long ago about a crew heading out to do a PR flight. There was a seasoned pilot at the controls, and a seasoned crew in back. 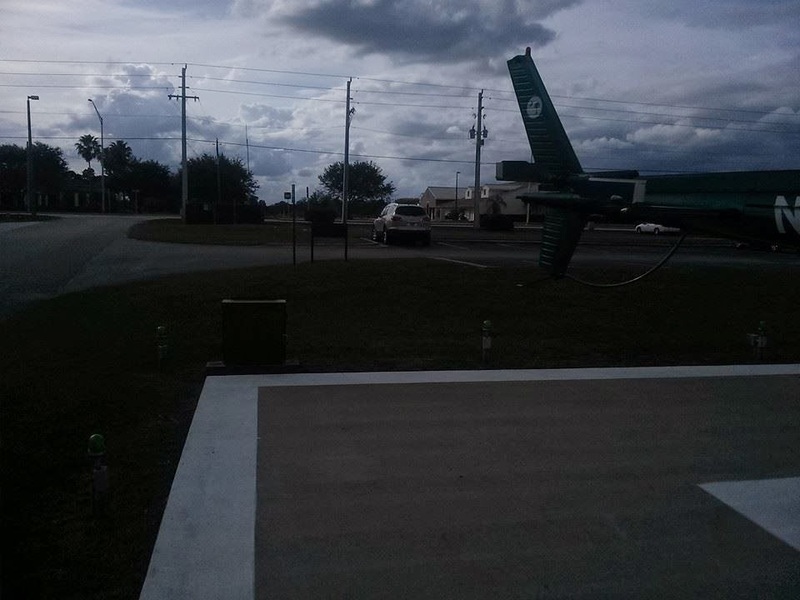 Sometime in flight, or perhaps after landing and on shutdown, the paramedic smelled fuel. He keyed up the mic and announced "I smell fuel." The pilot acknowledged the message and continued on with what he was doing. They shut down and got out, and the pilot wasn't taking any actions related to the fuel smell. The medic began to look into all the openings in the side cowls and observed fuel dripping from a filter assembly. He said, "hey, we have a fuel leak!" The pilot looked and said, "don't worry about it, it's just a drip, these things do that," and walked off to check out the PR. Time passed and they prepared to leave. The medic asked the pilot again about the fuel leak, the pilot became irritated and told him to get in. The flight team in question subsequently decided that this pilot wasn't "the right people," and they cut him loose. Pilots reading this are perhaps excoriating me right now, and to be sure any of the people involved with our work can have the "wrong stuff." Whatever - your job is to actively monitor who YOU are flying with and make sure they are right for you, and for your safety. And you friend have to be the right person too. If you are going to fly for two decades, and you don't want to be one of the forty-percent, make sure you keep yourself in the right place, at the right time, with the right people. AOPA Petitions the FAA for Increased Training Credit : Flight Training Devices. This is a timely topic for us in HEMS, as the new training rules called for in the HEMS rule (public law) will involve the increased use of flight simulators and flight training devices. Indeed, one of the questions put to the action team I serve on for NEMSPA was "how can the FAA incentivize the use of flight simulators?" Click here to read the AOPA letter to the FAA. FAA FTD Level 4 - Similar to a Cockpit Procedures Trainer (CPT), but for helicopters only. This level does not require an aerodynamic model, but accurate systems modeling is required. I have to admit, Colin tried to warn me. It was early 2004, and I was undergoing Bell 222 aircraft-transition and single-pilot instrument-flight-rules (SPIFR) training with Omniflight's chief pilot near Dallas, Texas. We were shooting approaches and mixing that with some traffic-pattern work and emergency-procedures training. While taking a break from the training, Colin had me get out and walk clear of the aircraft, then head backwards until I was abeam the tail rotor. The point he wanted to make was that the tail on a 222 is much longer and lower than the tail on the BK-117 that I was familiar with. Perhaps because I was tired, and concentrating on all the mistakes I was making during training, I didn't get his message - but he tried. A few weeks later, shortly after dark, I was flying the Deuce into Richland Hospital's helipad for our contract-opening meet-and-greet. I had two or three other pilots on board, and there was a crowd of hospital-folks on hand; up against the building. I completed my high recon, and set up for a landing to the west on the patient drop-off pad nearest the hospital, as another aircraft occupied the primary pad. I was very conscious of being watched as I made my approach, and tried to be as smooth and deliberate as possible in an aircraft that was still new to me. 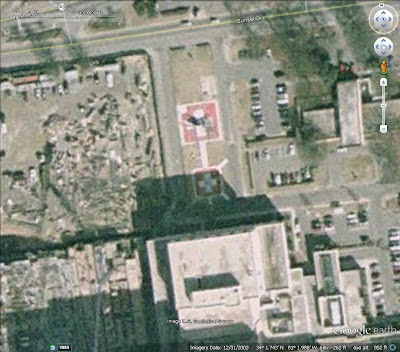 Without even thinking about why, I concentrated on landing dead-center on the helipad, with my aircraft right on top of the "H." I was completing the shutdown checks, and told the other guys they were clear to exit the aircraft. I sat there filling in the blanks on my forms when my door opened and one of the other pilots told me, "your tail is really close to a fence behind you, you need to shut it down!" I said, "hold on, I am almost done." He said, "no Dan, it's really close!" 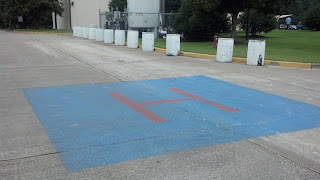 A pilot affiliated with the customer played it off by saying, "it's no big deal, he landed on the H." But it was a big deal. I almost damaged an aircraft, and and could have hurt some people; and I was actually trying to be careful. 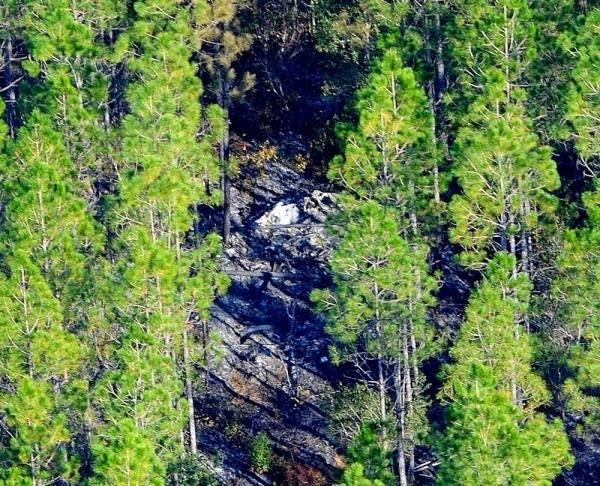 On July 2, 2009, about 2100 eastern daylight time, a Eurocopter AS 350 B2 helicopter, N53963, operated by Omniflight Helicopters Inc., was substantially damaged while landing at Loris Community Hospital Heliport (5SC5), Loris, South Carolina. The certificated commercial pilot and two clinicians were not injured. Night visual meteorological conditions prevailed and a company flight plan was filed for the medical positioning flight conducted under the provisions of 14 Code of Federal Regulations Part 91. The flight originated from Conway-Horry County Airport (HYW), Conway, South Carolina, at 2040. According to the pilot, the purpose of the flight was to pick up a patient at 5SC5 for transport. The pilot initiated an approach to 5SC5, to the west, into the wind. As the helicopter approached the helipad, the clinicians were "call(ing)" clear of obstructions, such as trees and light poles. 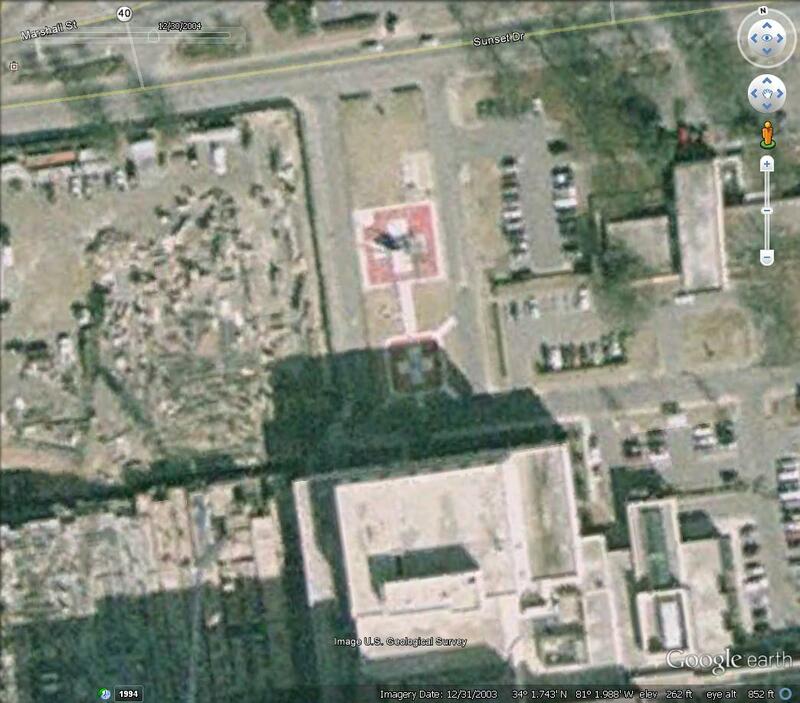 About 5 feet above the helipad, the helicopter shuttered and vibrated. The pilot continued the landing and performed an emergency engine shutdown. A Federal Aviation Administration (FAA) inspector subsequently interviewed the pilot and clinicians. The FAA inspector stated that although all three persons had been to the heliport before, they simply forgot about several steel poles aligned adjacent to the helipad. Just prior to landing, the tailrotor struck one of the steel poles, and the helicopter came to rest on the helipad. Two of the four steel poles were about 2 feet high and 4 inches in diameter, and the other two were about 3 feet high and 6 inches in diameter. The poles were placed along one side of the helipad along the perimeter line that separated the helipad from a road. According to the operator's Vice President of Clinical Services, all clinicians are trained with the pilots in Air Medical Resource Management (AMRAM). Through that training, the clinicians are taught to point out obstacles and hazards to flight. 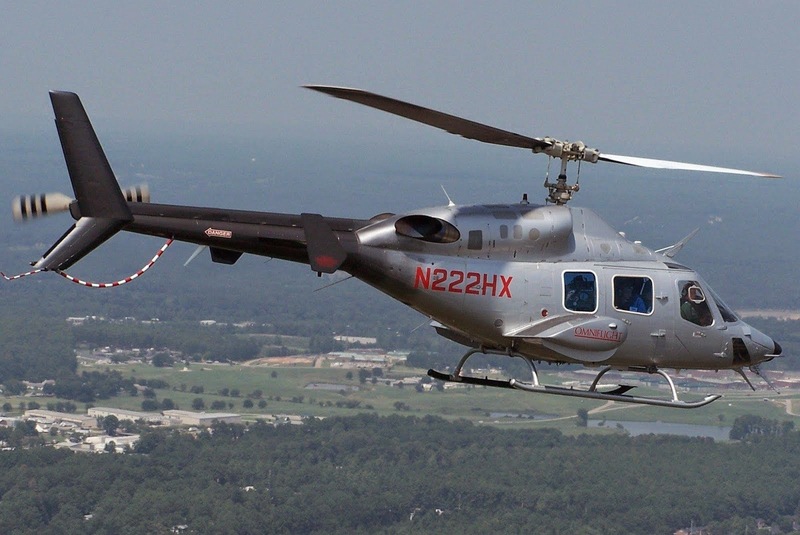 Examination of the helicopter by the FAA inspector revealed damage to the tailboom, tailrotor, tailrotor gearbox, tailrotor drive shaft, main rotor, and horizontal stabilizer. The recorded weather at an airport approximately 15 miles northeast of the accident site, at 2058, included calm wind, clear skies, and visibility 10 miles. The pilot had accumulated 2,587 total flight hours in rotorcraft, including 501 hours as pilot-in-command in the Eurocopter AS 350 B2 helicopters. The pilot logged 46, 19, and 2 flight hours in the previous 90, 30, and 1 days respectively. 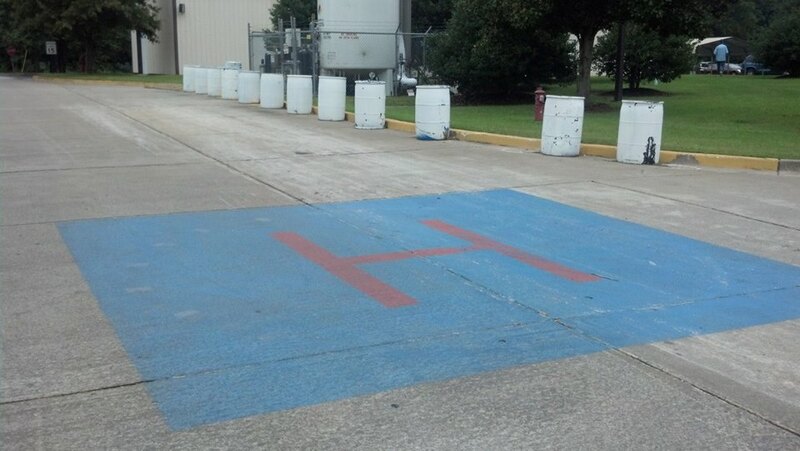 Subsequent to the accident, the hospital removed the short steel poles adjacent to the helipad. to learn all about what a helipad could look like, but in typical FAA fashion they have confused helicopter flight operations with commercial jet travel, and the airports they use and created a document and a set of standards that are, to put it tactfully, unwieldy. About a decade ago, the FAA set about making the last advisory circular on this topic regulatory. The industry pushed back, claiming that complying with the standards would make the use of helicopters too expensive, and would deprive the public of the benefits that helicopters provide. Then the industry went further, and tried to block the publication of the advisory circular (the last iteration) entirely, claiming that the AC would be a de facto regulation by way of lawsuits etc. That dog didn't hunt. The last time I checked, the only time the advisory circular must be complied with is when a helipad is completed using federal funds. Otherwise, anything goes. Now when a helipad is obviously an afterthought, it's much like landing at an accident scene, or "off-airport" in FAA-speak. I think these are actually less dangerous than those landing pads that have the look of legitimacy, and are almost correct. When landing on a road, one's senses are on high-alert, and trouble is expected. A hospital pad might be approached with a more relaxed attitude, or even complacency, because it's designed for the use of helicopters, right? Do you see the hazard in this picture? Every helipad that I have landed on that has been constructed by http://fecheliports.com/ has been well built, and safe, but even some of these don't comply with the advisory circulars grand designs and details Some FEC structures are more like works of art than utilitarian places to land a helicopter, but if I was in charge of getting a new pad built, and we had money, I would go with them. As I was briefing this topic this morning, my nurse, an experienced fellow new to us from New York, commented that he would have never thought that landing to the H would present a problem. Okay, he's not a pilot, but a pilot might think the same way. A while back some fellow quoted a line from an interesting bit of conventional wisdom, and because of my near-miss with my tail rotor it resonated with me. The source was posted today on JustHelicopters.com. It is line number 2, for good reason. After rotor RPM, nothing is so important as a working tail rotor for continued success. So having addressed the fact that people who have no idea about helipad design do so, and understanding that we should approach all hospital helipads as if the designer was trying to kill us; we might also say that in the case of an enclosed, or encumbered rectangle, we should land diagonally to provide the most room, nose-to-tail. The pilot said that upon landing at the scene he kept the helicopter operating with him at the controls, while the medical crew attended to the patient. After loading the patient into the helicopter, the paramedic did a walk around inspection, entered the helicopter, and called out the before-takeoff-checklist, while voicing an alert to the pilot concerning overhanging trees on the port side of the helicopter. The pilot acknowledged, and told the crew that he intended to pick the helicopter up into a hover, slide to the right, and then perform a left pedal turn to exit the scene to the west. The pilot said that while performing a left pedal turn at a hover, a vibration occurred throughout the airframe, and he immediately set the helicopter back on the ground, facing west. An EMS technician on the ground who had been observing the helicopter, stated that after the patient had been loaded into the helicopter, the helicopter was lifted into about a 3-foot hover, and then began to rotate and face into the direction of the light wind, coming from the west. After the helicopter completed the rotation into the wind, the EMS technician stated that it then began to increase altitude, and as the altitude increased the tail rotor struck a small pine tree limb that stuck out about 1 to 2 feet into, and over the westbound traffic lane closest to the median. He said he heard the change in pitch to the sound of the helicopter's engine, and also saw the tail rotor begin a slight "wobbling." At this point the EMS technician said the helicopter was about 6 to 8 feet off the ground, and he believes that the pilot sensed that something was wrong with the helicopter, and set the helicopter down firmly on the curbside lane, facing west. An examination reveal no evidence of a preaccident mechanical failure or malfunction to the helicopter or any of its systems. The simplest fix seemed to be asking pilots and crews to minimize manouvering while near the ground, ie. if you fly in and land safely, why not consider staying put, and when you leave, climb vertically until clear of obstacles. 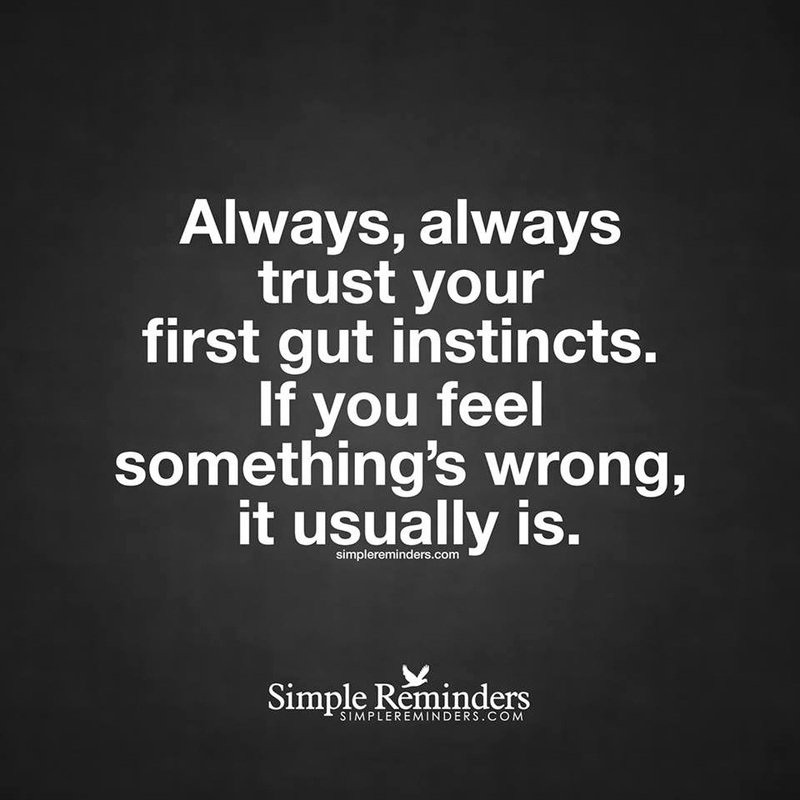 Every situation is different of course, but in any case moving around close to the ground is dangerous, and should be thoroughly briefed and understood by all involved - before moving... In the case above, it appears that the crew member attempted to advise the pilot of a nearby hazard, and the pilot acknowledged the advice - and then commenced to hit it. I am familiar with the event and can tell you that they only had to slightly touch a small branch to remove a fist-sized chunk of the skin and core of one of the tail rotor blades. This put the system out of balance, and the "wobbling" assembly was in the process of ripping itself off the tail fin as you might rip a beer can in half after drinking a few. What are we to do? Like the man said, guard your tail rotor... It's back there out of sight, but it can never be out of mind. All close-ground movements must be considered hazardous, and should be briefed in detail first. A positive "three-way" communication between pilot and observer might go something like, "guys, I need to bring my nose right and my tail left. Can you clear my tail left?" The response might be, "Yes sir, I can see to the left rear and your tail is clear" at which point the pilot would say, "nose right - tail left," and move the aircraft. Conversely, we might hear,"No Dan, I cannot see to your left rear, or "you are not clear" and then we won't do that move. When landing, and there is any question about the size and security of the area, stopping the aircraft at a safe hover altitude, and the pilot announcing, "I want to land here, does this look okay? Can you clear my sides and rear?" will help prevent striking an obstacle. This may require clinicians to let the patient go for a few seconds, when one is on board, but in the scheme of things I think it's a fair trade-off...This is simple crew-coordination, and it's how we stay alive.